Prepare for the next era of Garbodor-style Abilities! Naturally, Alolan Muk brings new life to the Muk line-up, and he's bringing back the old-fashioned Muk powers too! First things first, let's get that attack out of the way - Crunch is a hefty 4-for-90 move that has a 50/50 chance of getting rid of an Energy. Honestly, the low damage output combined with the coin flip make this attack not as good as it could be. Maybe if they bumped up the damage or took out the coin flip, Alolan Muk could've been usable on the offense, but as is, there's no good to it. But now we get his Ability, which is usually the more important part of these kind of Pokemon: the Power of Alchemy! 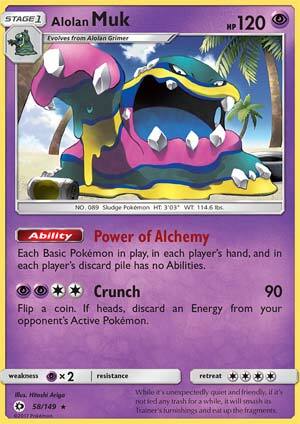 Aside from having an interesting name, the Power of Alchemy is relatively simple; while Alolan Muk is in play, all Basic Pokemon lose their Abilities in the hand, in play, and in the discard pile. Basically it's Silent Lab on a 120 HP body instead of as a Stadium! And given the next rotation will likely knock Silent Lab out of Standard - and potentially the Garbodor from BREAKpoint, though that's not as likely - Alolan Muk looks like a strong contender as the next option for decks looking to paralyze their opponents. ...except that Alolan Muk will come with all the downfalls of Silent Lab. While neutralizing the Abilities of Basic Pokemon covers a wide field, it doesn't cover some of the big Abilities found on evolutions. On top of that, there are Abilities that are showing up on Pokemon-GX now, some of which have to evolve from a previous stage, meaning Alolan Muk won't do much good against these Abilities. So naturally, Alolan Muk's usage will rise and fall with the competitive relevance of Basic Pokemon with strong Abilities, and while there are some prime examples here and now - looking at you, Volcanion-EX - I'm certain that later on, we'll find there to be even more Abilities that can be neutralized readily by Alolan Muk's Power of Alchemy. And we'll be ready for them. Arora Notealus: Alolan Pokemon are probably some of the most refreshing changes to Pokemon in a while. While it's always exciting to see new Pokemon in each region, I think the regional variants idea is an even better alternative to changing the line-up. If Muk can go from just a Poison-type to a Poison/Dark type and get rainbow colors, why not have other Pokemon introduced with other changes? Heck, Vulpix goes from Fire to Ice! Who'd have thought of that? Next Time: Take a throwback to a time from long ago, with a Pokemon that can travel through time! Time for our first look at another mechanic that is both new and old as we review Alolan Muk (Sun & Moon 58/149). In the core video game series, certain Pokémon from Gen I have different Types than usual justified in-game by the Pokémon adapting to the unique island setting. In the TCG, these Pokémon will follow the naming scheme demonstrated by today’s card: “Alolan” followed by their regular name. The card’s name is actually a pretty important stat; cards with the same name fight for the same allotment of deck slots (usually capped at four) and even if they are radically different, work with the same Evolutions. By giving them a distinct name, the Alola forms are functionally different Pokémon in the TCG. The TCG has employed an almost identical mechanic on and off since 2000 (or in Japan, since 1998)! Though I did not realize it when I selected Alolan Muk as our first Alolan form Pokémon, it covers some of the similar mechanics that have denoted either an “owner”, altered stats or both. I was going to get pretty thorough, but that is a topic for an article all on its own, so, for now I’ll just quickly explain Alolan Muk relative to Muk (BW: Next Destinies 53/99), Muk (BW: Plasma Freeze 46/116), and Team Aqua’s Muk. Like Team Aqua’s Muk must Evolve from Team Aqua’s Muk, Alolan Muk must Evolve from Alolan Grimer, while the other two Muk can evolve from either plain Grimer. Yes, even Muk (BW: Plasma Freeze 46/116), which I usually refer to as Muk [Plasma], the “[Plasma]” isn’t actually part of the card name. Recently, I was surprised to find Japan is still getting new cards in their equivalent of our XY: Black Star Promos, so if we ever got something like Muk BREAK, it would only work with Muk and Muk [Plasma], since both count as plain Muk. Okay, so with that out of the way, Alolan Muk is a Psychic Type, so if you attack with it, you can exploit the Weakness found on decent chunks of the Psychic and Fighting Types, but you’ll also have to deal with almost all Darkness and Metal Type Pokémon being Psychic Resistant. The tricks specific to Psychic Type Pokémon can help Alolan Muk, but the only one I think is really going to be relevant is how Wobbuffet (XY: Phantom Forces 36/119; Generations RC11/RC32)... and I’ll explain that a little later in this review. Similarly, some of the effects that can help with [P] Energy, and the pool of useful Psychic Types aren’t going to gain much from this card that wouldn’t also apply to other Types. Alolan Muk is a Stage 1, so while it isn’t super easy to slip into most decks, it isn’t too difficult; besides decks actually built around a particular Stage 1, several based on other Stages (not even just Basics) have managed to succeed while working in a 1-1 or 2-2 line of a Stage 1. Alolan Muk has 120 HP, which I think is just a bit more likely to be OHKO’d than not if it is Active. It is enough that Bench hits, supporting attacks, etc. still probably won’t work. Unless those attacks are from a Psychic Type and apply Weakness because Alolan Muk is Psychic Weak. This can be an issue because there are already some solid Psychic Weak and Psychic Type Pokémon on the competitive scene (often one and the same), so those decks won’t have to add anything to deal with Alolan Muk and the ones that do don’t may be able to copy what already works. Alolan Muk lacks a Resistance; typical, though it might have helped in a close matchup. What really hurts is the Retreat Cost of [CCCC]; this is the current printed maximum and is usually well beyond what you can pay, so build your deck to compensate. Alolan Muk has an Ability and an attack. The Ability is “Power of Alchemy”, and it shuts off the Abilities of all Basic Pokémon whether they are in play, in the discard pile, or in hand, like Silent Lab. This is where Wobbuffet and Alolan Muk being a Psychic Type matters; Wobbuffet has the Ability “Bide Barricade”, which shuts off Abilities of Pokémon in play while Wobbuffet is Active, but does not affect Psychic Type Pokémon. So Power of Alchemy will shut down Bide Barricade, instead of giving us a ruling headache. I am worried seeing this Ability; I don’t think Basics having an Ability is a problem, just the tendency of the designers to do a bad job of balancing out the overall design of many non-Evolving Basic Pokémon. I actually think most Evolving Basic Pokémon should have an Ability, as it is the easiest way to allow them to contribute instead of just being stepping stones for Evolved forms. Power of Alchemy doesn’t prevent this, but it suggests it isn’t happening and the status quo will continue. It likely needs it to continue, because if we go back to the most potent Abilities showing up on Evolutions, Alolan Muk becomes pretty pointless after another rotation or two. For [PPCC] Alolan Muk can use the attack “Crunch”, which does 90 damage and allows you to flip a coin; if “heads” you discard an Energy attached to the opponent’s Active. While overpriced, this isn’t absolutely awful but is probably so high that you’ll only end up running Alolan Muk as a Bench-sitter for the Ability, even in a Psychic Type deck. There are some forms of [P] Energy or general Energy acceleration you could mix with Alolan Muk, but apart from Lunala-GX it hasn’t proven effective, and even if Lunala-GX ends up working, I don’t expect it to have room for Alolan Muk. There is just a small, remote chance. As I stated earlier, Alolan Muk must Evolve from Alolan Grimer, and right now we only have one: Sun & Moon 57/149. It is a Basic Psychic Type Pokémon with 80 HP, Psychic Weakness, no Resistance, and Retreat Cost [CCC]. The HP is on the high end of what is typical for Evolving Basics and is enough that sometimes the Weakness will matter, but that Retreat Cost is painful, almost as bad as the slightly larger score on Alolan Muk. It is quite likely Alolan Grimer can get stuck in the Active spot, though it probably won’t last long there if your opponent is attacking. It isn’t all bad, though; Alolan Grimer can attack for no Energy. Busting out some shorthand I haven’t had to use in a while, for  Alolan Grimer can use “Super Poison Breath” to flip a coin; “heads” means the opponent’s Active is Poisoned, while “tails” does nothing. Not great, but good enough for the cost. If you do invest quite a bit, for [PCC] you can use “Pound” to do 40 damage. This is both underpowered - you want to be doing about 90 for three Energy - and overpriced, because you really shouldn’t have most Evolving Basic Pokémon in play long enough for them to accumulate three Energy; they ought to have Evolved before then, barring sufficient Energy acceleration. Alolan Muk has potential to become the new Bench-sitter decks include to combat Abilities, at least so long as there are enough Basics with worthwhile Abilities to deny. Sun & Moon has given us Oranguru - guess what we’re reviewing next week? - and we’ve seen at least one Basic with a potent Ability revealed in Japan (though not here, yet). Plus we have the many sets from the last half of the XY block that are still legal in Standard play… but we also have some significant competition as well from these older cards. Silent Lab is Alolan Muk as a Stadium; do you want to give up space for a Stage 1 line, or use up at least some of your Stadium slots? Some decks might need the Stadium for something else, but we also have Garbodor (XY: BREAKpoint 57/122); its “Garbotoxin” Ability shuts down all other Abilities, but for better or worse requires you attach a Tool to Garbodor for it to Activate. If you have Abilities on your own Evolutions or don’t want to mess with extra Tools for Garbodor, then once again, Alolan Muk has a niche of its own. Then there is Hex Maniac, a Supporter you can use to shut down Abilities for both players until the end of your opponent’s next turn. Finally, there are more deck specific options, such as attacks that can shut down Abilities. Putting it all together leaves very little room for Alolan Muk. Expanded play has more ways to deal with Stadiums and Tools, which would help Alolan Muk, but it also has more Evolutions with key Abilities, as well as Battle Compressor to make Hex Maniac more effective, so I am thinking it is worse of here… until someone pointed out that Trevenant BREAK decks can use Alolan Muk for an even stronger lock. For Limited play, I only see four Basic Pokémon with Abilities: Wishiwashi, Pyukumuku, Eevee, and Oranguru, but those are all worth countering, so I’d include Alolan Muk but probably as a Bench-sitter. I had almost talked myself into awarding Alolan Muk lower scores, but my otaku sense started tingling, by which I mean I was scared I might be wrong. Whether or not I should have, I had to do a minor rewrite and resubmit this review, because the Tuesday night I was reading up on Pokémon (like you do) and sure enough, I missed that this is reportedly becoming popular in Trevenant BREAK decks for Expanded play. So the kind of niche which I wasn’t sure I could find in Standard, found me and was in Expanded, where I acted like it couldn’t exist. When I first looked at this card, Alolan Muk got a “C+” both times, which translates to about a 3.25/5. I was going to rate it lower, and fear of another oversight makes me want to rate it higher… but I’m going to stick with the above scores, with the caveat that it could easily go up or down depending upon the shifting metagame.